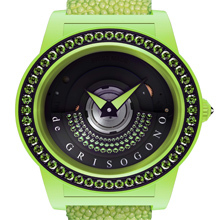 de GRISOGONO is set to turn heads with the new glowing TONDO BY NIGHT collection. A line that is at once playful, luxurious and technical. The refined art of gemsetting blends smoothly with the technical sophistication of an exclusive in-house movement specially developed to display a gemset oscillating weight on the front side. The spectacular models sparkle both by day and night thanks to an original pearly photoluminescent composite fiberglass material. de GRISOGONO pulls off an authentic master stroke by offering an innovative and vibrant interpretation of its contemporary baroque style. de GRISOGONO keeps creating trends that have put it at the forefront of the industry in both terms of technical innovations and breathtaking designs. In collaboration with an external lab, the TONDO BY NIGHT timepieces are daytime beauties that also shine at night thanks to Pearly Photoluminescent Composite Fibreglass (PLF), an innovative and exclusive luminescent material and enriched with small pieces of mother-of-pearl that give a stunning finish. This iridescent luminous material on the case and buckle, professionally tested to ensure total comfort, soaks up the daylight in order to lend it a glamorous glow when evening falls..
Amongst the first watchmakers to present a reversed oscillating weight on the dial side, de GRISOGONO’s TONDO BY NIGHT is automatically wound thanks to the energy supplied by the gemset oscillating weight. The Calibre SF 30-89 ensures a 42-hour power reserve. Admirably reflecting the vivid shades of summer, the TONDO BY NIGHT collection comes in several variations: white, yellow, pink, green, purple and orange. The Brand dedicated to excellence adopts a delightfully fresh new approach by offering a range of enchanting variations on its signature design codes. The black diamond on the crown, the Galuchat strap and the distinctive design of the Tondo case all stamp the collection with the hallmark of the inimitable de GRISOGONO style. These radiant and playful oval-shaped timepieces sparkle with a row of 48 gems on the bezel as well as 60 precious stones arranged in three rows on the oscillating weight.. Interpreted in various colours depending on the model, this precious timepiece glows with white diamonds, orange, pink or yellow sapphires, green tsavorites or amethysts. “I dedicate this watch to happy summer days and glamourous night life. It’s not only a luxury timepiece but can be also worn as a magnificent jewellery piece, with a twist.” explains Fawaz Gruosi, Founder and President of de GRISOGONO. For the TONDO BY NIGHT collection, de GRISOGONO weaves a spell of magic and glamour, once again demonstrating the Brand’s resolutely creative vivacity.